Anyone with kids can attest, traveling with little ones can be stressful. Many parents have a plan of attack to wrestle their kids into car seats and make the ensuing drive a bit easier. There’s trusty Goldfish crackers, a lively Disney sing-along or a portable DVD player. But what happens when your mom-mobile breaks down and ends up in the shop leaving you, and your five children, in the lobby of an Enterprise looking for a rental? Leave it to Nick L., Branch Rental Manager in Tampa, to answer this question and calm a flustered parent while solving her transportation needs. The customer thanked Nick by calling him her “guardian angel,” and she wrote a heartfelt letter of appreciation. The customer arrived at our branch on a busy Friday afternoon, where we were working to get a lobby full of customers on the road. The customer was going through a stressful auto claim with her insurance company and needed a replacement car right away. She had her five kids in tow, too. I pulled up her claim to figure out what type of vehicle she wanted to drive. She needed a minivan to transport her large family however finding vans was difficult because there was a recall going on. What did you do to help the customer? We work in a fast-paced environment so I had to keep calm and think quick. I immediately began to search for minivans at other nearby locations. Luckily, one popped up at a branch only about 10 minutes away. It was a celebration once I secured the van, and the customer let out a huge sigh of relief. What’s your reaction to the customer’s letter of appreciation? I felt just like the customer did when we found her the car she needed – ecstatic. She called me her guardian angel, and I can’t think of a better compliment. With such a large family, I’m sure the customer has a busy home life, so I’m grateful she took time out of her day to write a nice letter. But ultimately, I was just doing my job to make sure every customer walks out of our branch happy. Customer service is a learned skill, and Enterprise does an excellent job of teaching and showing us best practices of how to ensure everyone is completely satisfied. I try to be optimistic, enthusiastic and greet every customer with a smile. I also constantly try to empathize with customers. While I’ve handled many insurance claim rentals, this could very well be the first time the customer is going through the experience. So patience and clear communication is key. Above all else, I just try to do the right thing. I started two years ago as a Management Trainee. 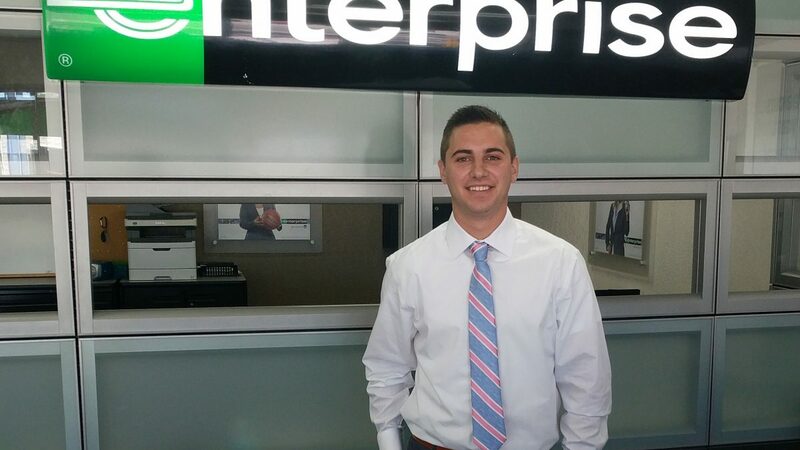 Eight months later I was promoted to an Assistant Manager, then worked my way up to a Branch Manager where I am today – all in the Tampa Operating Group. I feel very fortunate about my experience and advancement so far. I can’t wait to see where my career takes me next.